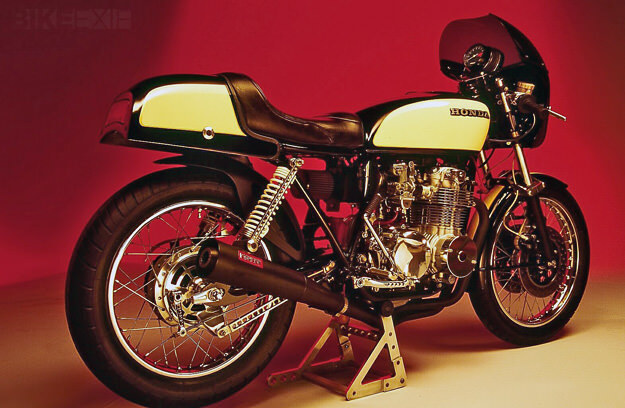 While browsing the addictive SOHC Forum, I stumbled across some images of this beautiful Honda CB550F Super Sport cafe racer. It’s owned by Larry Pearson, who was happy to provide a little background. This CB550F is no trailer queen, though: Larry will take it out for a blast on a sunny day through the twisties, and reports that it “handles, runs, and sounds great”. The bike came second in its class at the 2008 Legend of the Motorcycle Concours d’Elegance, and leaves me wondering what came first.